A review requested by Andrew Milne, with thanks for contributing to the Second Quinquennial Antagony & Ecstasy ACS Fundraiser. Throughout his career, director Kim Jee-woon has been an unapologetic generic magpie, unified only in that whether he's making a psycho-thriller like A Tale of Two Sisters, an absurdist Western like The Good, the Bad, the Weird, or even an American-made action film that fumblingly tries to serve as a comeback vehicle for a retired star, like The Last Stand, he's always primarily making character dramas. The generic elements inform the way that psychological arcs develop, but they are never more important than the basic, driving question: who are these characters, and why do they make the decisions they do? And on those grounds, it might even be the case that A Bittersweet Life, Kim's 2005 follow-up to his big breakthrough A Tale of Two Sisters, is the director's masterpiece. It's mostly a standard-issue revenge thriller set in the world of Korean gangsters, which is hardly a slight: for something so tawdry on paper, the Korean revenge thriller genre has produced a remarkable number of genuinely great films. But that also means it's easy to think you know what's going on with it, and that's not the case. 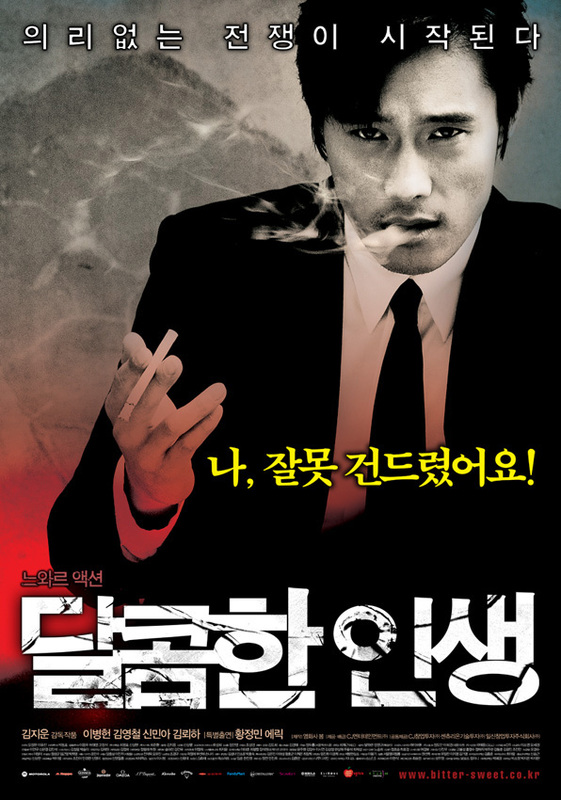 Sure, the basic story about mob enforcer Sun-woo (Lee Byung-hun) ending up on the wrong side of both opposing factions in a gangster war when he decides to commit an act of mercy in the name of love, proceeds much as it ought to, and even its plot twists seem "right" for it, without any dumbfounding shocks. But it is also far more about what's happening inside Sun-woo's head as this brutally efficient criminal finds himself nudged away from his own life long enough to see it from outside, and finds that it is not making him a terribly happy person. It is, you might even say, making him bittersweet, though you probably shouldn't and neither should I, since the actual Korean title translates more simply as "The Sweet Life". And is thus ironic instead of moody. There'll be time enough to dig into that, so let me first clarify that A Bittersweet Life is still, chiefly, an action thriller in its design, and for entire scenes that's the mode that dominates. So it's a good thing that it's also an extremely good action thriller, with some absolutely tremendous sequences littered here and there, and the best saved for last. The director and his cinematographer, Kim Ji-yong, employ a very fluid, loose, lithe style of camera movement that tends to glide along with the action and accentuate the movement and impact of it, without turning into John Woo-esque ballets of violence. In fact, the film maintains one steady foothold in a realistic aesthetic that's grounded far beyond the ordinary standards of most action films - or most Korean genre cinema that I know of, frankly. It is, somehow, both shiny and grainy at the same time, full of strong lighting and fully saturated colors that have unnerving presence and authenticity. The texture of the film's innards is profoundly real and tangible, which gives its burly attention to its violent outbursts an added weight. It's not necessarily the case that the action itself is more exciting as a result; but it certainly ends up feeling more tightly knitted to the film's psychological intentions. Sun-woo, living in a more realistic world, is affected more realistically by the brutal actions he witnesses and perpetrates. Which really is what it always comes down to. It would be giving the film too much credit to compare it to the best of Jean-Pierre Melville, but that's very much the territory that Kim is mining: a man is sick of himself and his world, and the film has a kind of hyper-present presentation of that world. For Melville, this tended towards glossy ennui; for A Bittersweet Life, it's more like a series of increasingly enervating adrenaline rushes, leaving the movie feeling a bit more worn and tattered every time. And, of course, leaving Sun-woo feeling worn. There's much that's great about the movie, but it's hard to imagine it having quite the same impact without Lee in the lead role; there are layers and layers that keep shifting their orders in his performance, sometimes an angry, hard killer; sometimes a sad romantic, sometimes a noble soul trying his best to be brave and moral and even, in the most unexpected places, optimistic. It's immaculately rounded and not at all stuck in the basic track of honor and tension that animates even the best gangster movie performances, though those things are present. Given the film's hoary inciting incident, the old "a beautiful woman melt's the thug's heart" sequence that absolutely wins no points for imagination or subtlety, I might even go so far as to say that the film's ability to feel human and not dimwitted and corny relies solely on Lee's ability to sell Sun-woo as a closet romantic, and make it clear just what an impact, down to his very core, this one woman has on him, and do those things without making a play for us to sympathise with him as a romantic lead. Basically, he has to underplay everything while expressing some very subtle, non-verbal cues as to how his character is re-evaluating himself because he fell in love - I'm honestly not even sure how that works, and yet Lee does it like it's no big deal at all. Compared to the best of its genre from around the same time - these were the years of Park Chan-wook's Vengeance Trilogy, and Bong Joon-ho's Memories of Murder, which between them set the bar inordinately high for Korean crime thrillers in the mid-'00s - it would be difficult to argue that A Bittersweet Life is necessarily one of the best out there, either stylistically (it is handsome, but in a somewhat conventional way), nor narratively (it focuses on unusual and enlightening aspects of broadly generic story elements). But it might very well be the case that Sun-woo is the most interesting character, and Lee's the most complex performance, to be found in any even superficially similar film of that generation. It's enough to give the film a clear personality and totally unique perspective that help it to stand out even in an crowded field of largely impressive thrillers. The worst things about it are still awfully solid, and the best things are deep and probing far beyond what you'd ever naturally expect from a film of this model, and it's quite a special treat because of it.